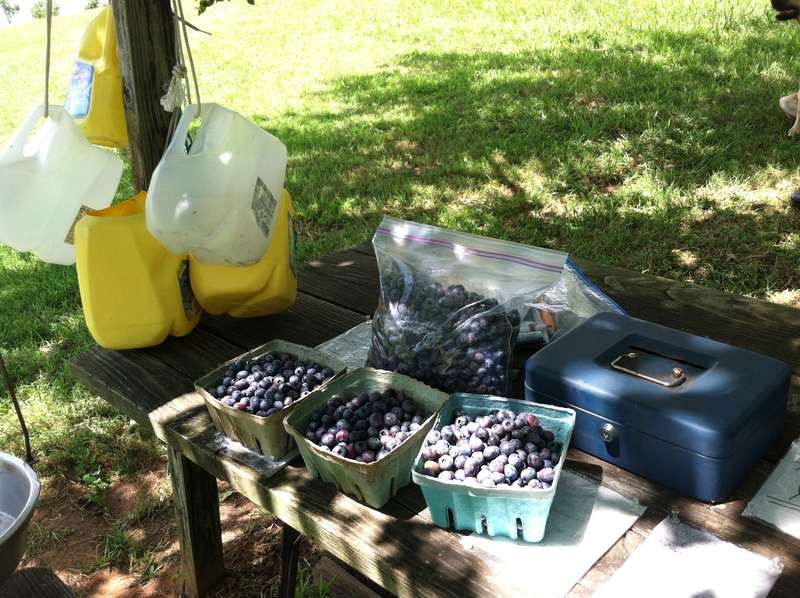 On a recent trip to the foot of the Blue Ridge mountains in Virginia, we were traveling the highway when I spotted a sign that said “Pick your own blueberries” and we made an impromptu and screeching halt. 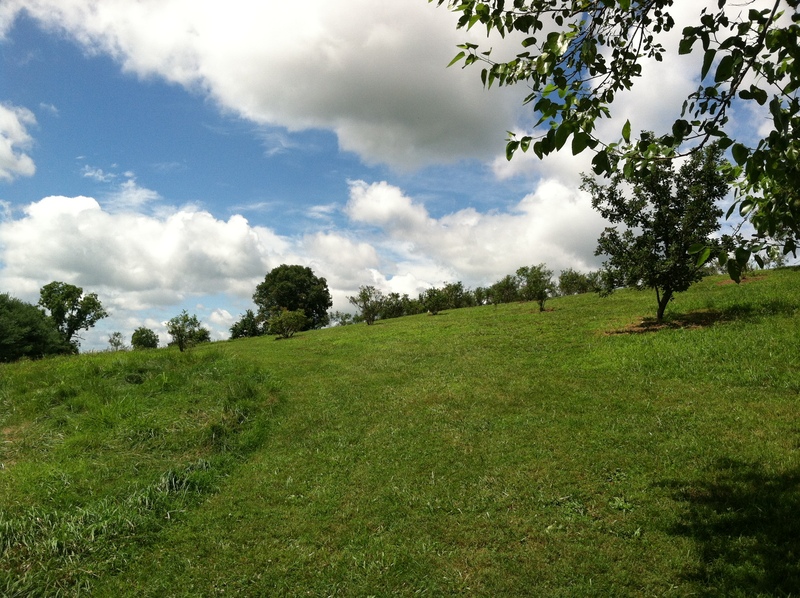 We entered the driveway and were confronted with a field of about 25o blueberry bushes that dotted a sunny hillside right next to the highway with cars whizzing past. No one was manning the field but the bushes were cared for with the field mown and the weeds pulled at the base of the bushes. The birds were everywhere, though there were berries enough for man and beast with blueberry laden branches brushing the ground . Entering the farm field and weighing station, we were in another world with painstakingly written signs instructing us how to pick the berries on the honor system. The notes also updated us on how the family was doing, that someone had passed away, and informed us that an old dog named Cap might stop by and we were to pet her and call her by name! The picking was made easy by an ingenious container which was simply an old milk jug with the top cut off and a piece of clothesline around the handle so you could slip it on over your head for hands free picking. The jug could hold a couple of pounds of berries easily! 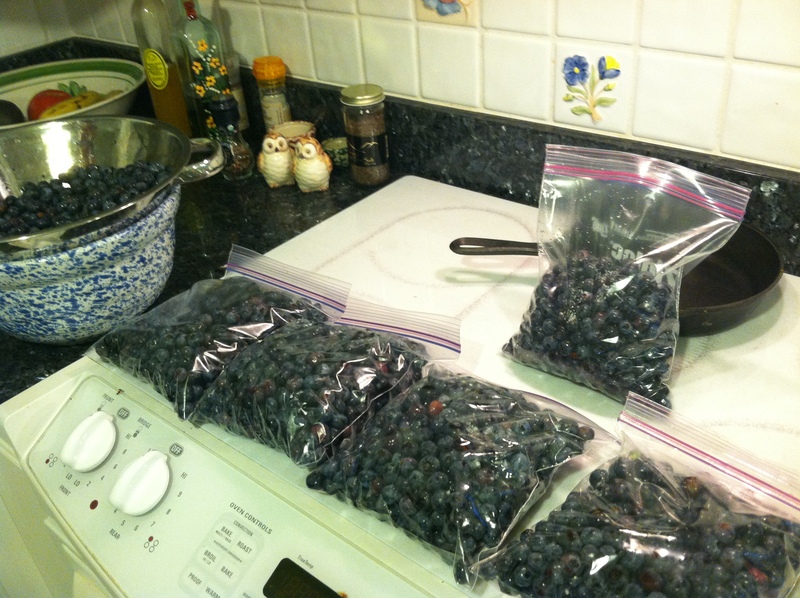 After picking for an hour in intense heat, we weighed up and picked almost 10 pounds of blueberries at 2.50 a pound. That is a lot of blueberries as the berry is so small. It is hard to accumulate some weight with blueberries rather than strawberries which fill up your container much faster. 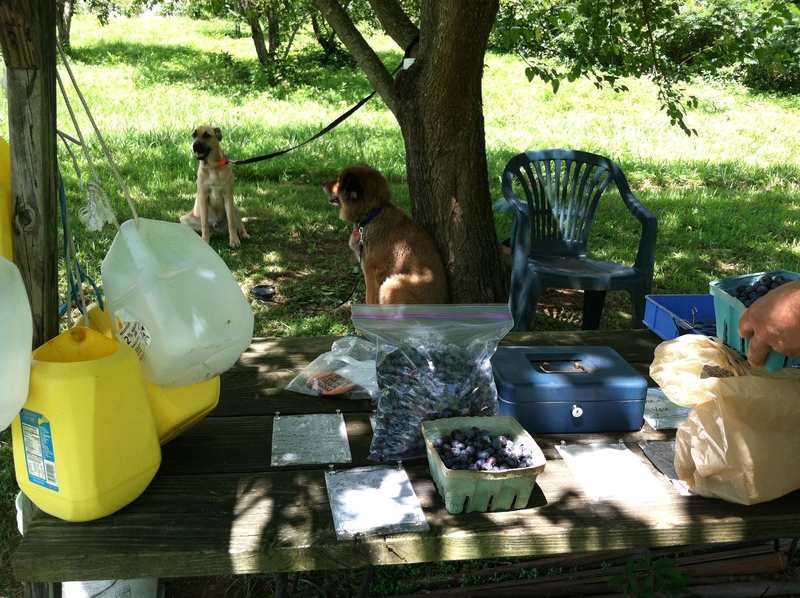 After weighing in and transferring the berries to green cardboard containers, we put our money in the slot of the cash box and left with our bagged and boxed up berries, never seeing the farmer. 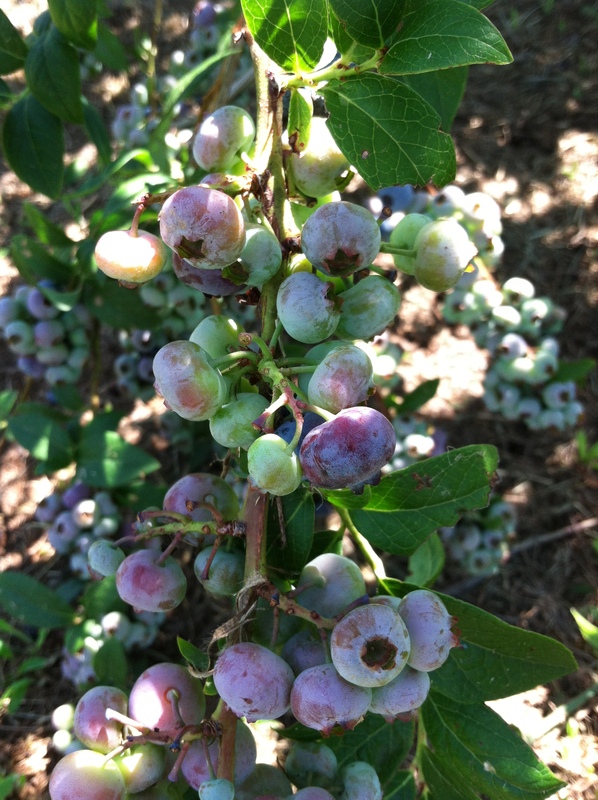 The variety that we picked was the Rabbiteye blueberry which is native to the southeastern United States and is unique in that a native southeastern blueberry bee, Habropoda laboriosa pollinates. Virginians mostly grow the Rabbiteye variety as it is suited to southern climates. 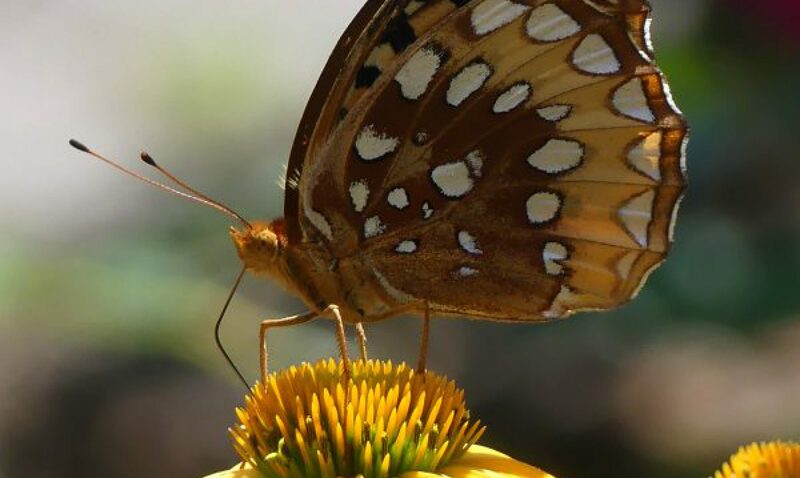 Here in MD, it is unique in that we can grow both the Rabbiteye and the Highbush variety which is native to the northeast. They both have pros and cons, but the Rabbiteye shrub gets larger and lives longer than the Highbush. 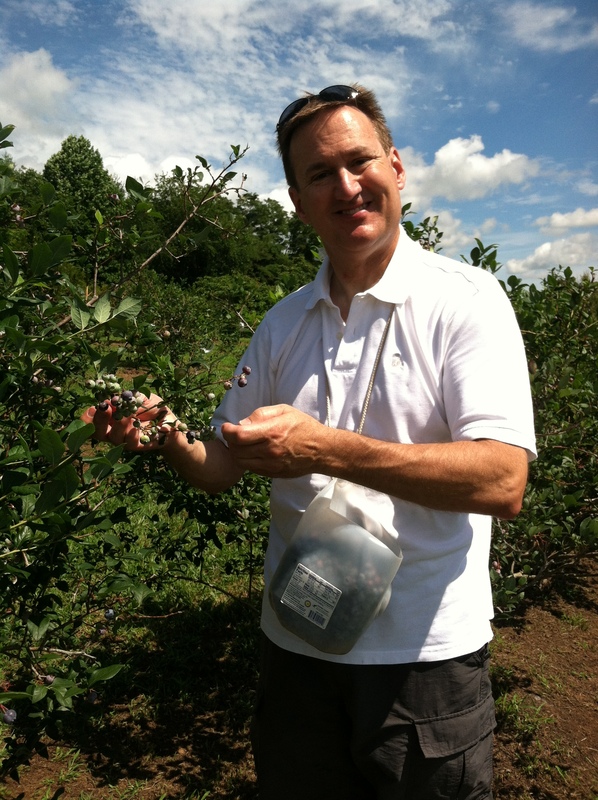 So, while I was in Virginia, I visited a nursery and picked up a Rabbiteye blueberry variety called Premier. In the nursery it was full of ripe berries and after I bought it, I picked at least a quart of berries off the bush! I am going to plant it next to my Highbush varieties and compare the two. Supposedly, the Rabbiteye isn’t as hardy but I think in MD it will be OK.
After getting the berries home and washing them, I filled up gallon freezer bags with the berries and stuck them in the freezer. With the garden chores during the summer, I will put off the process of blueberry jam making until winter when I have more time. Beautiful writing and photos of my #1 fruit. Great job! Thanks, I try to have fresh blueberries al year in my house because they are so good for you. We have always had more than enough blueberries for everyone in the family except this year. I think we are going to have to move two of our highbush blueberries because they are in almost total shade because of tree growth. 🙁 There is absolutely nothing like blueberries in the dead of winter – delish. My blueberries are planted in partial shade and are getting more shaded as years go by and I have definitely noticed a decline. That is hilarious and amazing! I love the milk jug necklaces. I miss pick-your-own farms. We used to do that as kids all the time growing up in Oregon, but it’s not very common in San Diego for some reason. And blueberries are definitely my favorite! So glad you got to have such a fun adventure. This area is definitely full of pick your own everything!